Papergreat: Tearless onion slicer: "It is her first invention"
Tearless onion slicer: "It is her first invention"
This newspaper clipping comes from an issue of the St. Paul (Minn.) Dispatch from sometime in the span of Oct. 28-31, 1935. Weep no more, oh lovers of onions! A tearless onion slicer has been invented by Mrs. Vera Vath, 3242 Chicago avenue, Minneapolis and is shown being examined by Florence Susag of the Harmon hotel1, Minneapolis, who almost wept with joy. "I love onions," Mrs. Vath said, explaining her device, "but they used to make me cry. Besides, I knew how cooks in hamburger shops suffered slicing them. So I invented an airtight slicing machine." A cardboard oatmeal box served for the first model, while a later model, with real knives inside, was made of metal. It is her first invention. I doesn't appear that Mrs. Vath's invention was a huge hit, does it? Plenty of people, of course, have tried to design the perfect tearless onion slicer over the years. Here's a "vintage" one for sale on Etsy. Here's another neat one that's available from Janet's Depression Glass & Country Store. And here's a (somewhat dry) look at some of the patents related to tearless onion slicers over the years. NEW YORK -- The ages-old battle for a fool-proof way of slicing onions tearlessly may have been won by an 8-year-old girl. According to a recent report in the New York Post, Rachael Kaminsky is one of 12 finalists for the 2000 Craftsman/National Science Teachers Association Young Inventors Award for her tearless onion slicer. Kaminsky is a third-grader at Concord Road Elementary School in Ardsley, N.Y. 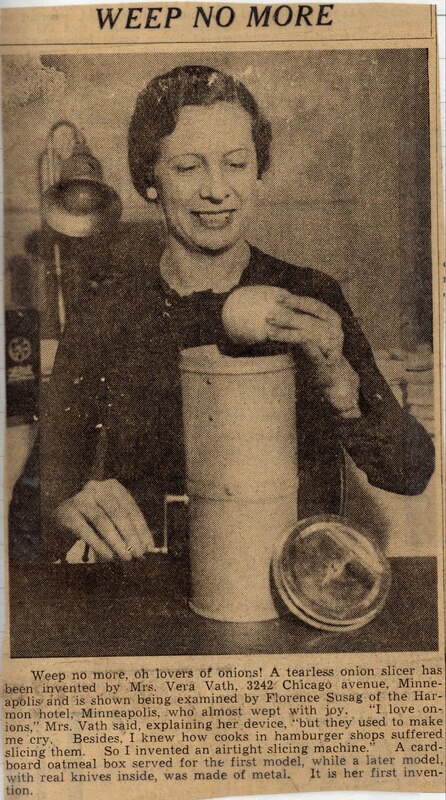 Her contraption is described as a bowl-shaped, plastic food container with an apple corer at the bottom. The corer slices the onions, while a bag of baking soda and a pastry cloth are used to trap and absorb the odor of the onions. 1. The Harmon Hotel in downtown Minneapolis was converted into condominiums sometime after 1972.